Have you ever turned your favorite plant into a paper craft? I personally love ferns and moss! Fun fact: The Pacific Northwest is home to about 40 species of fern. We’ve made paper fern wreaths, some felt ferns, and these potted paper ferns. 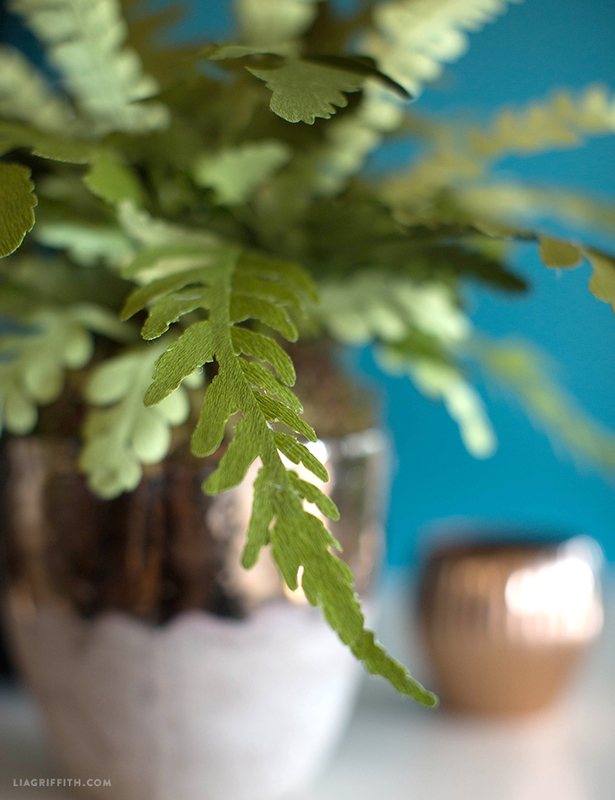 This time, our designer May created a double-sided crepe paper fern plant for one of our entryways that we recently redecorated (stay tuned for more on that!). 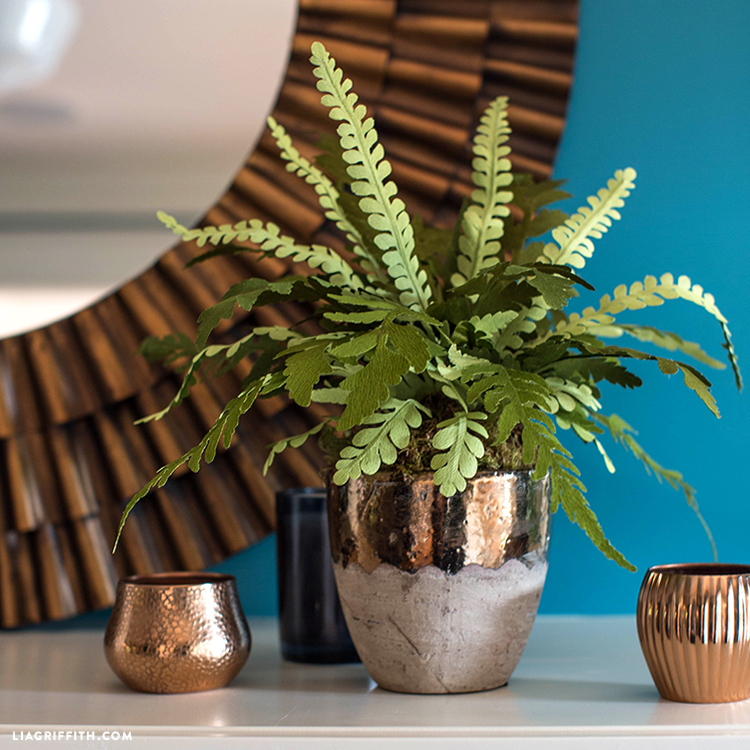 If you love the look of plants and want to add some zero-maintenance greenery to your home or office, try making this paper fern plant! If you have trouble keeping plants alive, this DIY project is perfect for you. 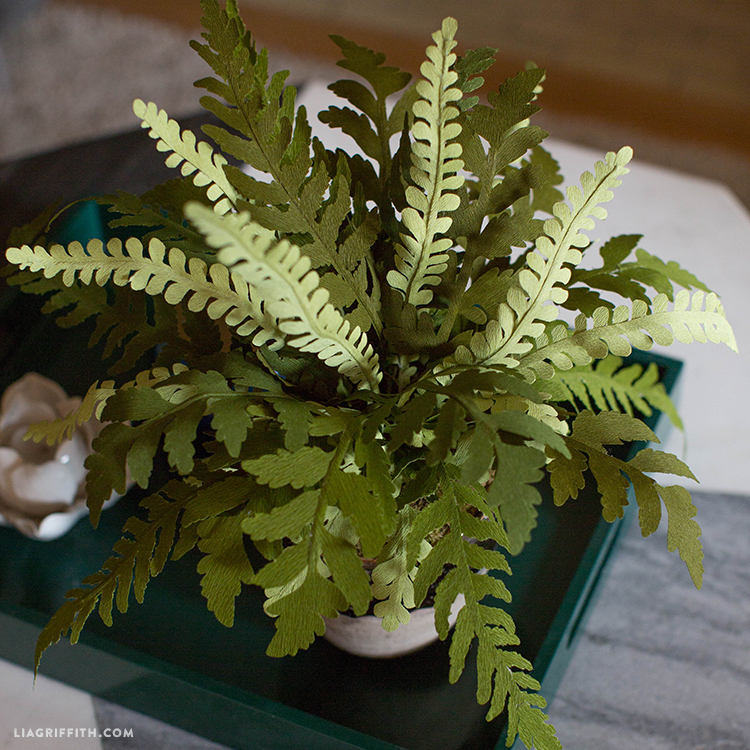 Once you’re done making this fern, all you have to do is decide where it goes! 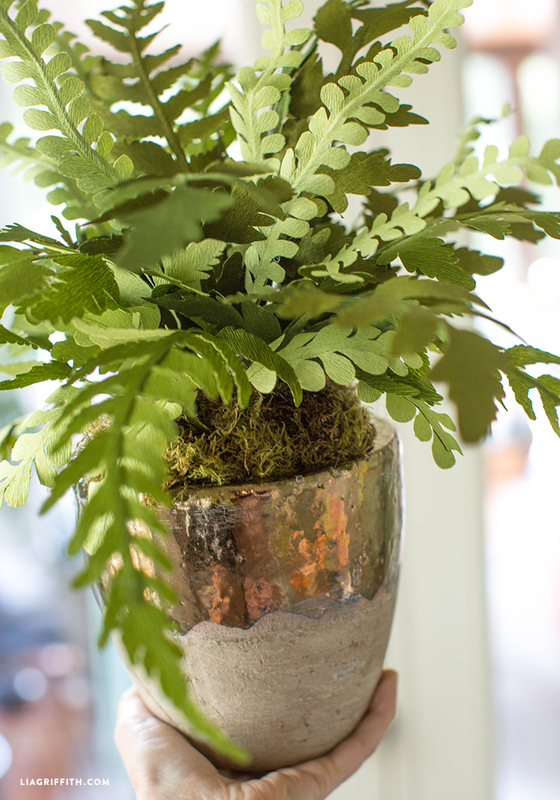 Before you make this project, make sure you’ve picked out a pot you want for your paper fern plant. Then fill the bottom with floral foam and top it with faux moss, which you should be able to find at your local craft store. 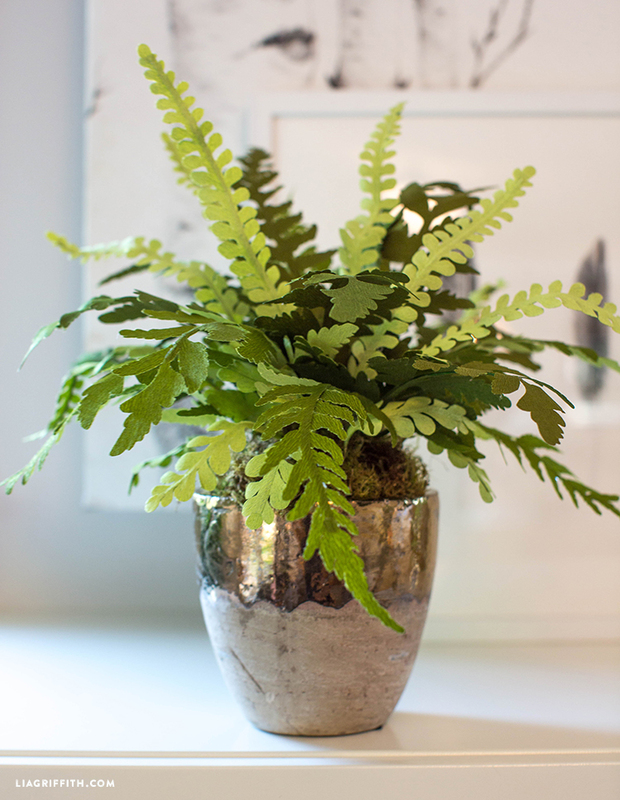 You can use a cutting machine or cut your fern leaves by hand (just download the template below). Make sure your floral wire is at least two inches longer than each leaf. Then, use some hot glue to attach the floral wire to the center of the leaf. Once you’ve done this for all your fern leaves, use the two inches of floral wire we mentioned earlier to stick your leaves through the moss. 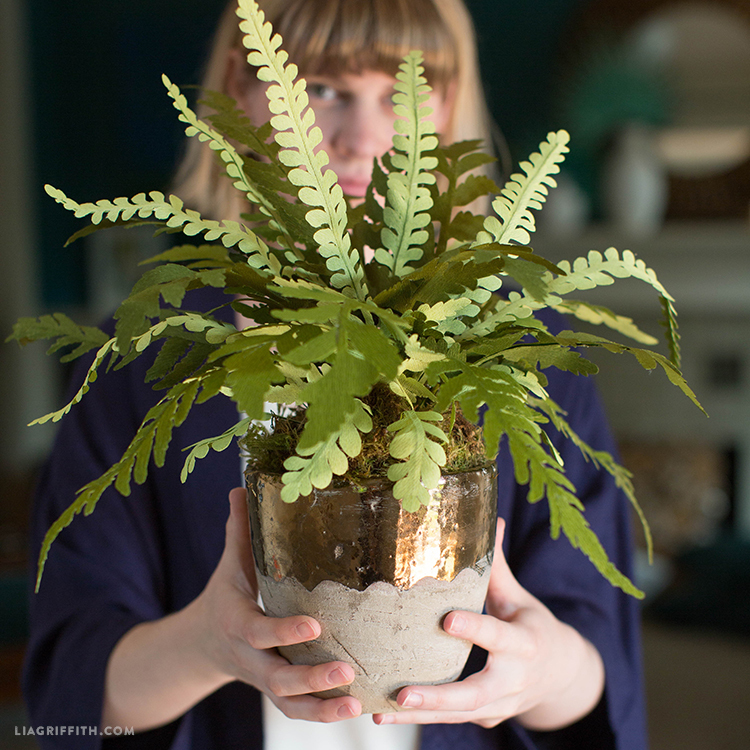 You can make this fern in just four simple steps! 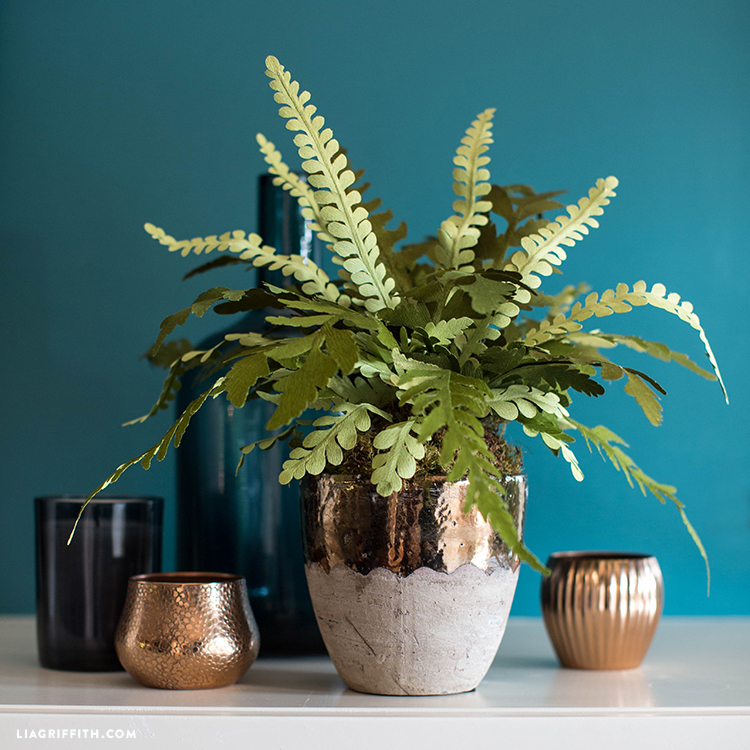 We’ve included a photo tutorial below for making this double-sided crepe paper fern plant, but you can also scroll down for printable instructions. 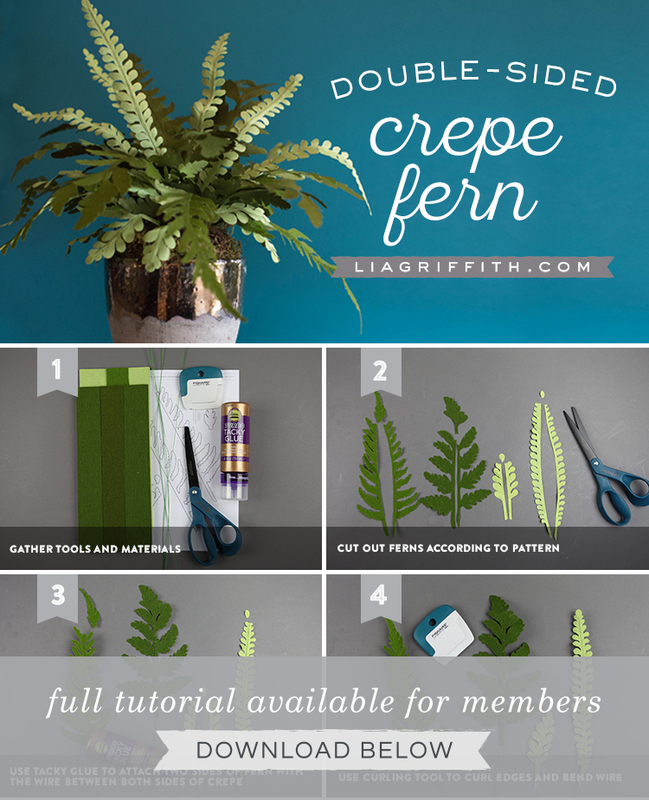 If you make this fern (or you’ve made one of our other paper or felt ferns before), make sure to share it with us by using the hashtag #MadeWithLia on Instagram. I’m loving my new hobby of making crepe paper flowers with my Cricut Maker. However, I had problems with the double-sided fern svg file. I was able to upload the svg file into Design Space and modify it, but when I clicked the “Make it” button, the screen didn’t move past the green circle spinning around instead of going to the screen where I would select the material type. Could you please advise on what I should do? I’ve used many of the svg files from LiaGriffith without any problems. So glad to hear you’re loving your new hobby! Have you by chance tried this again since you wrote the other day? We were experiencing the same issue in Design Space last week, but it seems to be fixed now. If you’re still having trouble, please send an email to hello@liagriffith.com. I wish there was a video on this can I ask why the tops of the ferns are separated from the rest of the ferns ? Hi Anita! The tops are glued on at the end because they don’t overlap as nicely as the bottom half, and to give a more polished look to the fern. Is there a blade that can be used with Explore Air 2? The rotary blade is only for cricut Maker. Sadly, no– from what we understand from Cricut is that the Maker is the only machine that can handle the rotary blade because of the adaptive tool system. Can you tell me what the Fern name is with the rounded leaves ? Thank you ! We cut it from the double-sided Green Tea & Cypress crepe paper. We used the pink fabric mat with the rotary blade. It worked for us! Beautiful…will there be an svg for it?